Centranthus sibthorpii Heldr. & Sart. ex Boiss. Valeriana hortensis Garsault nom. inval. It grows as a perennial plant, usually as a subshrub though it can take any form from a herb to a shrub depending on conditions; the plants are usually woody at the base. The leaves are generally 5–8 cm in length. Their form changes from the bottom to the top of the plant, the lower leaves being petiolate while the upper leaves are sessile. The leaves grow in opposite pairs and are oval or lanceolate in shape. The plant flowers profusely, and though the individual flowers are small (no more than 2 cm), the inflorescences are large and showy. The flowers are small in rounded clusters each with 5 fused petals and a spur. The most typical color is a brick red or purplish red, but colors include deep crimson, pale pink, and lavender. Centranthus ruber 'Albus' (about 10% of individuals) has white blooms. Flowering takes place in early summer and, in cool summer areas, continues sporadically throughout the summer and into fall. The cultivar 'coccineus' is especially long-blooming. The blooms have a strong and somewhat rank scent. They are pollinated by both bees and butterflies and the plant is noted for attracting insects. 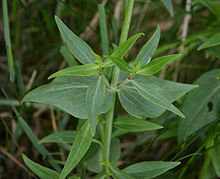 It is used as a food plant by the larvae of some Lepidoptera species including Angle Shades. Seeds have tufts similar to dandelions that allow wind dispersal, and as such can self-seed freely and become invasive if not properly controlled. A native of the Mediterranean region, Centranthus ruber has been introduced into many other parts of the world as a garden escape. It is naturalised in France, Australia, Great Britain, Ireland and the United States. In the US it can be found growing wild in such western states as Arizona, Utah, California, Hawaii, and Oregon, usually in disturbed, rocky places at elevations below 200 m. It is often seen by roadsides or in urban wasteland. It can tolerate very alkaline soil conditions. Because it can tolerate the lime in mortar, Centranthus ruber may frequently be seen growing in old walls in Italy, southern France and south-west England. Centranthus ruber showing both petioled and sessile leaf forms. ^ "The Plant List: A Working List of All Plant Species". Retrieved 8 April 2015. ^ a b c d "Centranthus ruber". Germplasm Resources Information Network (GRIN). Agricultural Research Service (ARS), United States Department of Agriculture (USDA). Retrieved 8 April 2015. ^ a b "Centranthus ruber - Invasive Species | Cape Town Invasives". www.capetowninvasives.org.za. Retrieved 2016-06-29. ^ "NEMBA Invasive Alien Species Regulations List published for public comment". ^ "Invasive Species South Africa - Protecting Biodiversity from Invasion - Red valerian | Centranthus ruber". Retrieved 2016-06-29. ^ "Invasive Alien Plant Alert | SANBI". www.sanbi.org. Retrieved 2016-06-29. 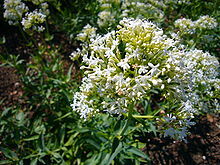 Wikimedia Commons has media related to Red Valerian.